November 7th 2017 is the 150th anniversary of the birth of Marie Sklodowska Curie (1867 – 1934), the only woman to ever be awarded two Nobel prizes. Here we reproduce Chapter 4 from Out of the Shadows: Contributions of Twentieth-Century Women to Physics, 2006 Marie Curie (1867 – 1934)’ by author Abraham Pais. Marie Curie (November 7, 1867–July 4, 1934), baptized Maria Sklodowska, was born in Warsaw, the fifth child of Wladyslaw Sklodowska, a physics teacher, and Bronislava née Boguska. In her high-school years she read French, German and Polish poets, all in the original language, gave lessons to earn money, and in 1886 became a governess for three years. In 1891, she moved to Paris to study physics at the Sorbonne, graduating in 1893 at the top of her class. In April 1894, she met the physicist Pierre Curie (1859–1906), whom she married in July 1895. By then his career was already well underway. He had done important work on piezo-electricity, on symmetries of crystals and on magnetism. They had two daughters, Iréne (1896–1956) and Eve (1894–). Marie was a devoted mother, bathing her two babies every day herself. Soon after Marie had completed her first paper, dealing with magnetism of tempered steels, she heard of Becquerel’s discovery (1896) of “uranic rays,” which she discussed with her husband. “The study of this phenomenon seemed to us very attractive . . . I decided to undertake the study of it . . . In order to go beyond the results reached by Becquerel, it was necessary to employ a precise quantitative method.” For this purpose she developed a new tool, an early form of the parallel plate ionization chamber: two condenser plates, 3 cm apart, each 8 cm in diameter. A modest 100 volt potential difference between the plates and a sensitive electrometer was all she needed for her work. Her first paper on this new subject contains two major new points. (2) Marie’s first paper clearly shows that her insight into what constituted a “normal” increase of radioactivity with increasing uranium content was sufficiently quantitative to note that two minerals, pitchblende (rich in uranium oxide) and chalcite (rich in uranyl phosphate), behaved anomalously: “[They are] much more active than uranium itself. This fact is very remarkable and leads one to believe that these minerals contain an element which is much more active than uranium.” With this conjecture she introduced another novelty into physics: radioactive properties are a diagnostic for the discovery of new substances, the second of the major points of her first paper on radioactivity. Photograph of Marie Curie. From ACJC-Curie and Joliot-Curie fund, with permission. The radiation emitted by uranium when unseparated from its daughter products does indeed represent, to a very high degree, a steady state of affairs. It took two years from Becquerel’s initial discovery until the first parent–daughter separation was affected. It took another two years until it was firmly established that radioactivity does diminish with time. Uranium exhibits no appreciable change of state, no visible chemical transformation, it remains, or so it seems, identical with itself, the source of energy which it emits undetectable – and therein lies the profound interest of the phenomenon. There is perhaps a disagreement with the fundamental laws of science which until now have been considered as general . . . The materialistic theory of radioactivity is very attractive. It does explain the phenomena of radioactivity. However, if we adopt this theory, we have to decide to admit that radioactive matter is not in an ordinary chemical state; according to it, the atoms do not constitute a stable state, since particles smaller than the atom are emitted. The atoms, indivisible from the chemical point of view [author’s italics], are here divisible, and the sub-atoms are in motion . . . The materialist theory of radioactivity leads us . . . quite far. If we refuse to admit its consequences, our embarrassment will not lessen. If radioactive matter does not modify itself, then we find ourselves again in the presence of the question: from where comes the radioactive energy? And if the source of energy cannot be found we are in conflict with Carnot’s principle, a principle fundamental to thermodynamics . . . We are then forced to admit that Carnot’s principle is not absolutely general [and] . . . that the radioactive substances are able to transform heat from the ambient environment into work. This hypothesis undermines the accepted ideas in physics as seriously as the hypothesis of the transformation of the elements does in chemistry, and one sees that the question cannot easily be resolved. (Cette hypothése porte une atteinte aussi grave aux idées admises en physique que l’hypothése de la transformation des éléments aux principes de la chimie, et on voit que la question n’est pas facile a résoudre.) M. Curie. It is important to stress at this point that these fascinating puzzles were never any hindrance to progress in those days. If anything, the contrary is true. The field of radioactivity was young when these questions arose, the tasks were enormous. While these problems were given much thought by the Curies, that never inhibited them from continuing their superb research. In her doctoral thesis, Marie Curie raised yet another puzzlement. This document has a section entitled “Is atomic radioactivity a general phenomenon?” in which she reported on the analysis of substances other than uranium and thorium compounds: “I undertook this research with the idea that it was scarcely probable that radioactivity, considered as an atomic property, should belong to a certain kind of matter to the exclusion of all other.” It is to her credit that of all the materials she examined (including a dozen rare earths) she found no evidence for radioactivity. Radioactive phenomena form a world apart, without any connection with the preceding [phenomena]. It seems therefore that radioactive phenomena originate from a deeper region of the atom, a region inaccessible to our means of influence and probably also to our means of observation, except at the moment of atomic explosions. Rutherford’s discovery of the nucleus had been announced the preceding May. I do not know whether Marie Curie did not follow up on her wise remark with a comment on the nucleus because she was unaware of this work, or did not believe the results, or failed to see the connection. Nor do I know why Rutherford, who was in the audience, refrained from drawing Curie’s attention to the nucleus. However, what may be the long and the short of the matter is that radioactivity prior to 1911 has turned out to be prenatal nuclear physics. Pierre Curie’s discoveries of the experimental laws of piezoelectricity and of what became known as the Curie temperature in ferromagnetism are samples of his outstanding contributions to physics. He also labored mightily alongside his wife on the problems of radioactivity. 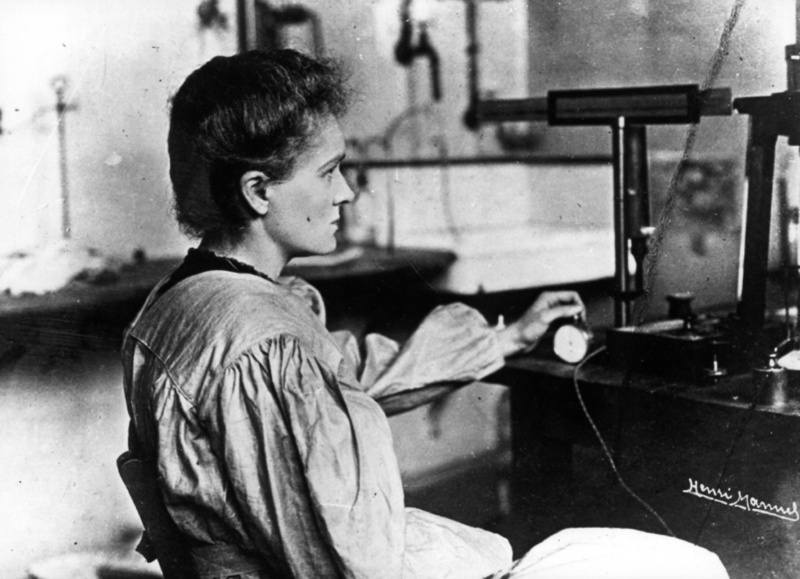 But, insofar as one can rely on the record of published papers, it is Marie Curie, a driven and probably obsessive personality, who should be remembered as the principal initiator of radiochemistry. That is abundantly clear, it seems to me, from her April, 1898 paper, discussed at length earlier. As to their later life: in 1900, Pierre was appointed assistant professor at the Sorbonne; Marie, teacher at a high school for girls. Continued intense research and teaching duties were so exacting that she had no time, until 1903, to complete her Ph.D. thesis, a masterful summary of her work to date. She received her degree on June 25 with the distinction “trés honorable,” an elegant understatement. That day was memorable to her for another reason as well: in the evening she met Rutherford for the first time. In November of that year, the Curies were in London to share the Humphrey Davy Medal of the Royal Society and were informed that they would share the 1903 Nobel Prize with Becquerel, “in recognition of the extraordinary services they have rendered by their joint researches on the radiation phenomena discovered by Professor Henri Becquerel.” The Curies’ prize was the subject of the following comment by the New York Times of December 11, 1903: “The discoverers of radium have, it is understood, not profited financially from the work as greatly as might have been expected, and their admirers throughout the world will be delighted to hear of this windfall for them.” They never took out patents for any of their discoveries. In December, 1904, Nobel laureate Marie Curie was named assistant to Pierre at the Faculté des Sciences of the Sorbonne. Until then she had been working without pay. The Curies were too unwell and overworked to attend the ceremony in person. When they finally went to Stockholm, in June, 1905, only Pierre delivered a Nobel Lecture, as his wife sat and listened. Meanwhile, in 1904 a special chair had been created for him at the Sorbonne. It appears that Pierre suffered from radiation sickness during the last years of his life, which came to a cruel end on April 19, 1906. He was not yet 47 years old. What happened on that day has been described by his wife. [As he] was crossing the rue Dauphine, he was struck by a truck coming from the Pont Neuf and fell under its wheels. A concussion of the brain brought instantaneous death. So perished the hope founded on the wonderful being he thus ceased to be. In the study room to which he was never to return, the water buttercups he had brought from the country were still fresh. Shortly after Pierre’s death, Marie was named his successor at the Sorbonne. Itwas the first time in that venerable institution’s more than 600-year-long history that a woman was appointed to a professorship. The Paris papers treated this as a major event. On Monday, 5November, 1906, at 1:30 in the afternoon, Marie began her inaugural lecture, continuing a discourse on radioactivity at precisely the point where Pierre had left off in his last lecture. In 1910, she declined the Legion of Honor. Marie Curie’s life in 1911 was marked by two events, one humiliating, one gratifying. In the autumn of that year, news items appeared in the French press, quoting private letters, and alleging the existence of an affair between Mme. Curie, widow, and the physicist Paul Langévin, married, a disgusting public treatment of private matters, probably true. In November, she received word that she had been awarded the Nobel Prize for chemistry for 1911, “in recognition of the part she has played in the development of chemistry: by the discovery of the chemical elements radium and polonium; by the determination of the properties of radium and by the isolation of radium in its pure metallic state; and finally, by her research into the compounds of this remarkable element.” In her Nobel Lecture, given on December, 11 1911, she recalled that many of these discoveries were made “by Pierre Curie in collaboration with me . . .” The chemical work aimed at isolating radium in the state of the pure salt “. . . was carried out by me, but it is intimately connected with our common work . . . I thus feel that . . . the award of this high distinction to me is motivated by this common work and thus pays homage to the memory of Pierre Curie.” She is the only woman ever to have been awarded two Nobel Prizes. During World War I, Marie Curie organized and participated in the work of a number of radiology units for diagnostic and therapeutic purposes. She arranged for the equipment of some twenty automobiles with Roentgen apparatus in order that soldiers could be operated on near the battlefield. She also oversaw the installation of some 200 radiological rooms in various hospitals. She trained others as X-ray diagnosticians and often acted as one herself. In 1921, she paid a triumphal visit to the United States, where she was received by President Harding. In May, 1922, she was named member of the League of Nations’ International Committee on Intellectual Cooperation, and took an active part in its work for many years thereafter. The fifth Solvay Conference, largely devoted to the new quantum mechanics, was held in October, 1927. The printed proceedings of this meeting appeared in 1928. They open with a tribute by Marie Curie to Hendrik Lorentz, who had presided over the October conference and who had died shortly thereafter. Meanwhile, Marie continued her research activities. In all, she published about 70 papers, the last one in 1933. Soon thereafter, at age 66, she died in a sanatorium in the Haute Savoye after a brief illness. The death report reads as follows: “Mme Pierre Curie died at Sancellemoz on 4 July 1934. The disease was an aplastic pernicious anaemia of rapid feverish development. The bone marrow did not react, probably because it had been injured by a long accumulation of radiations.” She was buried at Sceaux, near her husband. She just did not live long enough to hear of the Nobel Prize in chemistry (1935) award to daughter Iréne and her husband Frédéric Joliot (1900–58), for the discovery of positron radioactivity. There have been and there are, scientific couples who collaborate with great distinction, but there has not been a second union of woman and man who represented, both in their own right, a great scientist. Nor would it be possible to find a more distinguished instance where husband and wife with all their mutual admiration and devotion preserved so completely independence of character, in life as well as in science . . . I was most strongly impressed by their extreme simplicity and modesty together with their extraordinary devotion to their task . . . There was about both of them an unostentatious superiority . . . [Pierre’s] disposition made him stand aloof when she entered upon something like a romantic enterprise: the search for an unknown element. The complete works of Pierre Curie appeared in 1908, those of Marie Curie in 1954. Of particular interest in the latter book are the elegantly written essays on the status of radioactivity at various times. Biographies by Marie Curie of her husband (in which an autobiographical sketch is included), by Eve Curie of her mother and by Robert Reid, also of Marie, are especially important. Why are there so few prominent female physicists? 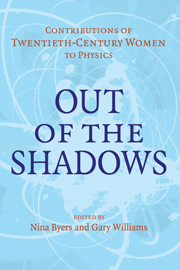 Originally published in 2006, Out of the Shadows provides an accurate and authoritative description of the women who made original and important contributions to physics in the twentieth century, documenting their major discoveries and putting their work into its historical context. Each chapter concentrates on a different woman, and is written by a physicist with considerable experience in their field. We are celebrating Marie Curie’s life and legacy on her 150th birthday with a collection of blogs and free content around the theme of Women in STEM. Curie, M., Pierre Curie (New York: MacMillan, 1929). Curie, M., Comptes Rendus, 126 (1898) 1101. Schmidt, G. C., Annalen der Phys., 65 (1898) 141. Curie, M. and Curie, P., Comptes Rendus, 127 (1898) 175. Curie, P., Curie, M. and Bémont, G., Comptes Rendus, 127 (1898) 1215. Soddy, F., The Interpretation of Radium, 4th edn. (New York: Putnam, 1920) p. 83. Curie, E., Madame Curie (New York: Doubleday, 1938). Jaffe, G., J. Chem. Educ., 29 (1952) 230. Rutherford, E., Nature, 134 (1934) 90. Curie, M., Rev. G´en. Sci. Pures et Appl., 10 (1899) 41. Thus one realizes a source of light [sic], quite weak to be sure, but which functions without a source of energy. There is here a contradiction, or so it seems, with the principle of Carnot [the first law!]. Curie, M., Rev. Scientifique, 14 (1900) 65. Curie, M., Recherches sur les substances radioactives, Ph.D. thesis, 1903; Engl. transl. : Radioactive substances, A. del Vecchio (New York: Philos. Library, 1961). Curie, M., in Theorie du Rayonnement et les Quanta, eds. P. Langevin and M. de Broglie (Paris: Gauthier-Villars, 1911) p. 385. Eve, A., Rutherford (Cambridge: Cambridge University Press, 1939) p. 80. Curie, P., Oeuvres (Paris: Gauthier-Villars, 1908). Fate has not willed it to be so, and we are forced to bow before its incomprehensible decision. Reid, R., Marie Curie (New York: Dutton, 1974). Curie, M., La Radiologie et al Guerre (Paris: F. Alcan, 1921). Joliot-Curie, I., Prace Marii Sklodowskiej-Curie (Warsaw: Panstwowe Wydawnictwo Naukowe, 1954); text in French.